It has been a year since Toyota introduced the redesigned Tundra pickup and they are not standing on their laurels. More changes and additions are being integrated into the 2015 models, including standard V8 power across the lineup and a new TRD Pro model with special off-road suspension. For the new vehicles, the Tundra comes standard with a 4.6L i-Force V8 with 310 hp at 5,600 rpm and 327 lb.-ft. of torque at 3,400 rpm. The 5.7L i-Force V8, which has proven to be Tundra’s most popular, generates 383 hp at 5.600 rpm and 401 lb.-ft. of torque at 3,600 rpm. The larger engine can be ordered either as gas only or flex-fuel certified. No diesel, but for now, only Ram offers a diesel in its 1/2-ton pickup. No change to the transmission for 2015. Either engine is paired with a 6-speed electronically-controlled automatic. Rear wheel drive is standard with available optional 4WD. The 2015 Tundra boasts up to 10,500 tow capacity for a regular cab 4×2 model with a tow package, and here’s where Toyota deserves some applause. Toyota was the first pickup manufacturer to adopt the Society of Automotive Engineers (SAE) towing standards in 2011. Since then, other half-ton pickup makers have adopted the standard for all trucks that are redesigned. For example, the 2015 Ford F-150 will issue its tow rating using the SAE standard. Until now, manufacturers have done their own testing rather than utilizing a standardized method and process. The adoption means that it will no longer be a case of comparing apples and oranges. 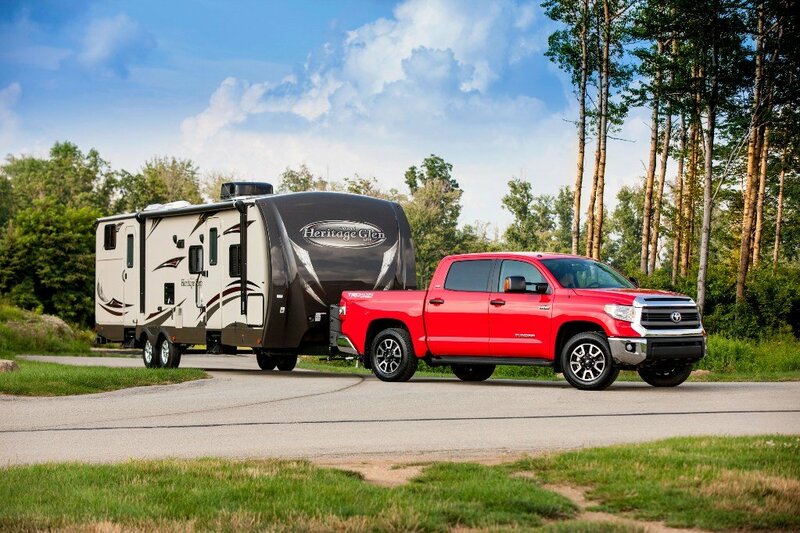 Equipped for towing, the Tundra gets a one-piece towing receiver integrated into the frame prior to bed installation, special rear springs to help level full-load rear suspension height and maintain a full range of suspension travel. Also part of the tow package is an upgraded cooling and electrical system, a heavy-duty battery and alternator. The 7- and 4-pin connectors sit above the hitch to avoid damage during high-departure-angle driving. 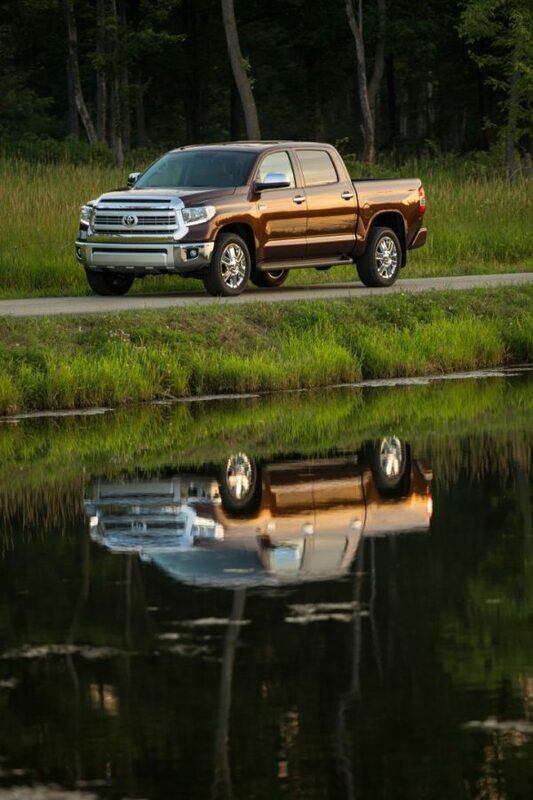 In late 2014, Tundra models equipped with the 5.7L V8 and tow package will finally have an integrated trailer brake controller (ITBCV), which was not available on the 2014 model. Better late than never. The ITBC includes analog controls near the driver’s right knee and feedback is displayed on the standard 3.5″ info display in the combination meter. I would like to have seen this on all Tundra models, but on the 4.6 L models there is an under dash pre-wire for installation of an aftermarket brake controller. Since I am a big fan of factory installed features, I wish that Toyota had made the integrated brake controller available on the 4.6L models with tow package. Even as an option, this would have been a feature that I believe consumers would include if they do any towing. Other features on the tow pack are a selectable tow/haul shift mode to adjust throttle sensitivity and transmission shift control, as well as trailer sway control. On 5.7 L models tow with heat, power, turn signal indicators and manual-extend feature are available. Applause again to Toyota for having backup camera standard on all Tundras. I wonder why so many manufacturers are still holding out when it comes to making this safety feature standard. Everyone knows that this is going to be required by Federal law and still some are dragging their feet. I am a big fan of the Tundra TRD Pro for off-roading and I have had a chance to drive the upgraded model. Available in black, white or Inferno red, it looks like taking the path less traveled in part of the plan. It has a special blackout grille, TRD Pro bed panel stamping, skid plate, matte satin black badges and black headlight bezels. Eighteen-inch TRD black alloy wheels wrapped in Toyota-exclusive Michelin Off-Road Package tires, continue the look and it is available, of course, only with the 5.7 L V8 with a TRD dual exhaust system. The TRD Pro has received a complete suspension upgrade that raises the front of the vehicle two inches for level ride height and extended wheel travel. The package also includes larger diameter TRD-tuned Bilsteinb high performance shocks with internal hydraulic bump stops and piggyback external reservoirs. If you loved the look of the redesigned 2014 model, you will love 2015, as well. The rugged yet refined styling has been well-received by Tundra lovers, and there are many. At a press briefing Friday at the plant in South San Antonio, the operation — which had a planned annual capacity of 200,000 Tundras and Tacomas — is now turning out about 235,000 per year. 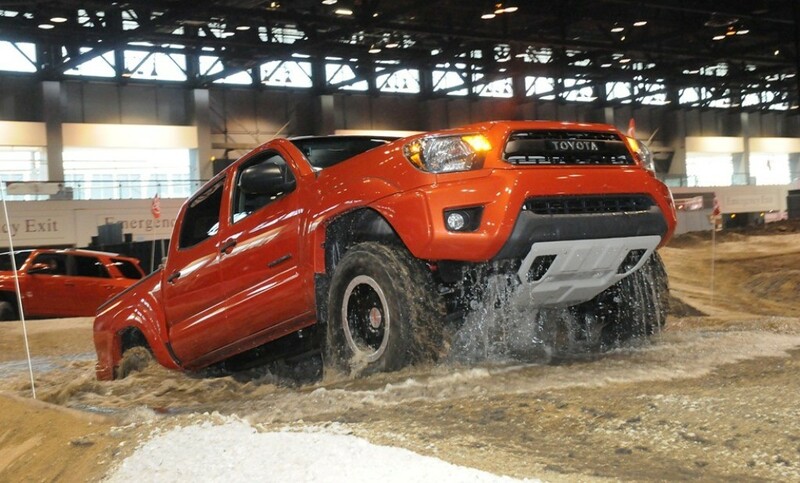 It is no surprise that a new Tacoma is in the works for 2016, and it will be interesting to see how Toyota accommodates more production capacity.